There are just 4 Ultra Cameo Washington examples certified in ALL GRADES! It is extremely difficult to find a 1951 quarter with Ultra Cameo frost. This beauty boasts a heavy, fully frosted bust of Franklin smothered in Ultra Cameo snow. The reverse offers an eagle covered in an even layer of bright, snow-white frost. Jet-black mirrors hold no spots or haze. 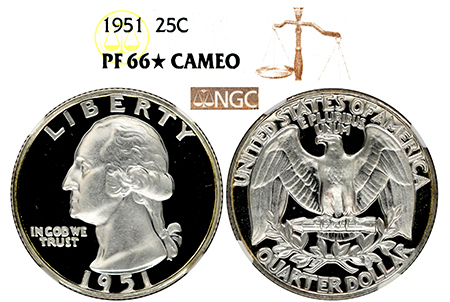 1 of just 3 graded by NGC, this is a knockout 1951 for such a tough year in Cameo condition!